Preschoolers are eager learners! 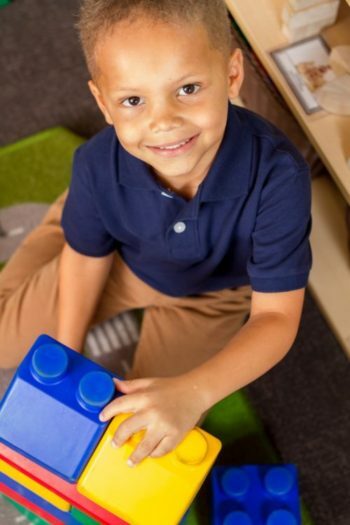 Their increased fine and gross motor control and growing communication skills enable them to participate in more independent activities as they pursue their natural curiosity to explore and integrate and discover their world. At Stepping Stone School, our teachers support, integrate and nurture your preschooler’s eagerness to learn. This is accomplished by introducing routines and offering positive guidance techniques which in turn inspires confidence and new skill sets. Weekly, theme-based learning plans meet individualized needs through research-based activities. This atmosphere matches your child’s rapidly emerging interests and abilities through a consistent-yet-changing environment which offers many opportunities for early literacy, pre-mathematics, scientific investigation, and imaginative play as a part of our Platinum Learning for Life™ curriculum. Interacting with books, listening to stories and learning concepts of print. Listening to and participating in rhyming songs and fingerplays. Building vocabulary skills in both quantity and quality. Pre-writing experiences using sensory play like writing in sand or finger-painting. Experiencing the joy of physical movement by playing games and dancing. Developing fine motor control by painting, coloring, gluing, working puzzles and building with blocks. Improving gross motor coordination by climbing, hopping and tumbling in our secure and closely monitored indoor and outdoor natural play areas. Building hand-eye coordination through tossing games and ball play. Expanding positive interactions between peers. Experiencing a classroom environment of respect for one another’s feelings and needs. Enhancing problem-solving skills through guessing and listening games. Developing pre-math skills by recognizing shapes, matching and sorting objects, identifying patterns, and counting. Participating in sensory play by using artistic mediums and early scientific investigation. Applying abstract thinking skills through discovery based learning opportunities.